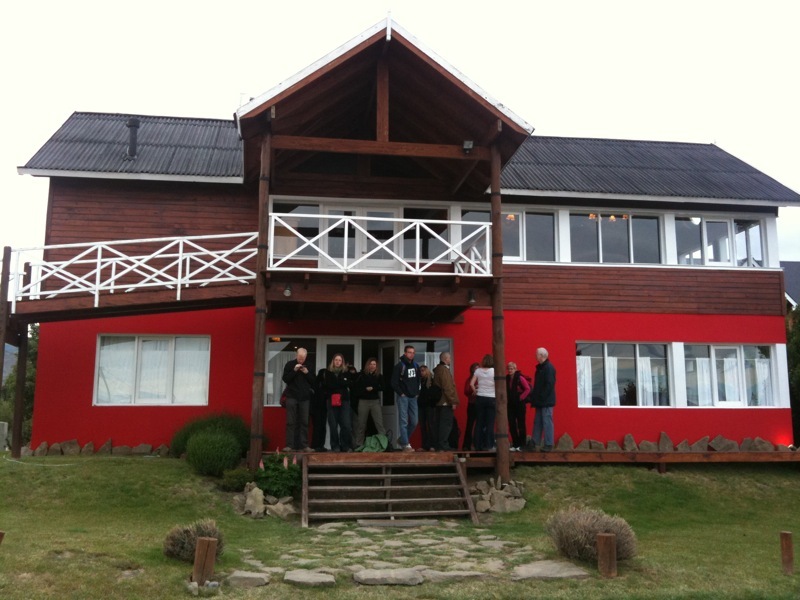 We arrived in Calafate not long after sunset, which in Patagonia means 10pm. As the bus rolled down the main street, we liked what we saw: great atmosphere, a picturesque town full of life. 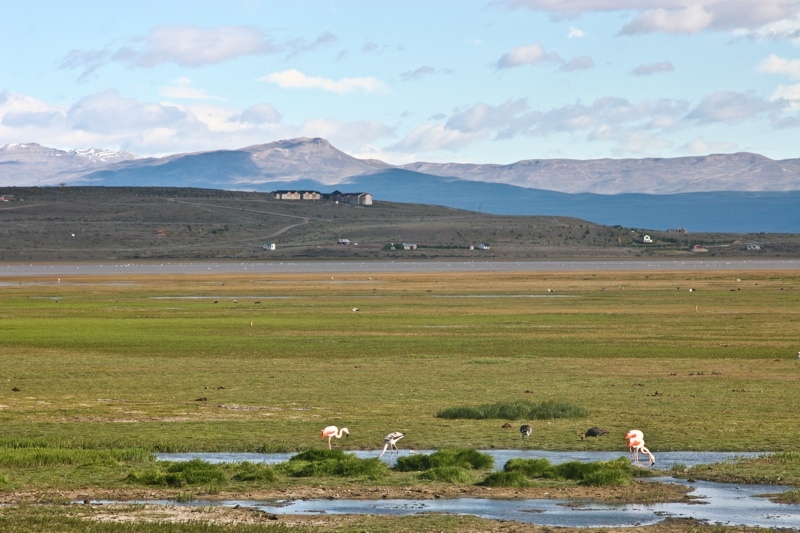 Gem announced that our hotel would be the Cauquenes de Nimez, featuring a lagoon with real pink flamingos (though cauquenes mean geese in Spanish). "Sweet!" we thought. But the bus didn't stop; the driver just kept going making seemingly random turns onto dirt streets, and we quickly started to doubt whether we were still in Calafate, after all it's not that big a town. At long last we arrived, and though we couldn't spot a lagoon in the dark, we did see it the next morning out in the distance from the second floor breakfast room. True to form, the lagoon was indeed inhabited by flamingos. And we weren't that far from the town center, though we suspected the reason we perceived the bus ride took so long was because Gap didn't want us to see the luxurious hotels in between, fitted with swimming pools, gyms, and golf courses! I mean the Cauquenes was not bad at all. It was brand new and clean, but it was the size of a matchbox and featured way more rooms than could possibly fit within its tiny townhouse-like floor plan. In fact, the beds were so narrow that they carried substantial risk of its occupants accidentally falling over in the middle of the night. Day four began with a proper breakfast of eggs, bacon, and toast. Jocelyne, being French Canadian, even got the hosts to turn her regular toast into French toast, off the menu. They were eager to accommodate, perhaps grateful no one had fallen off one's bed during the night. 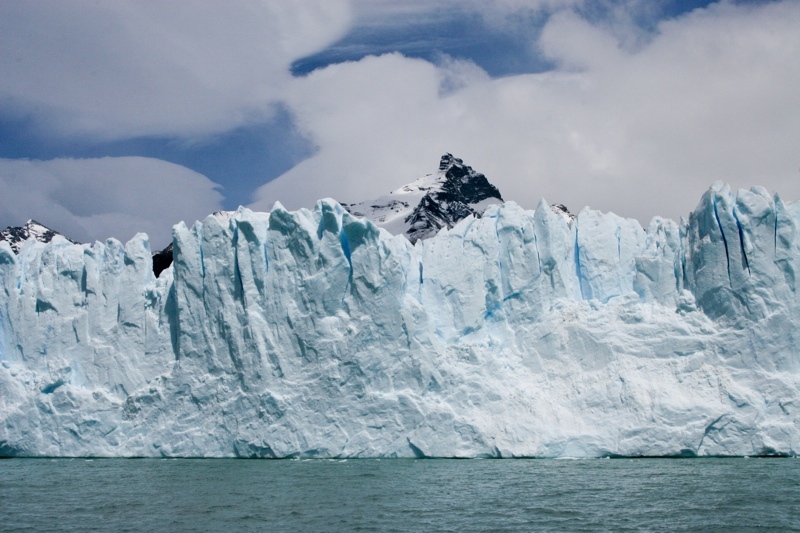 After breakfast, the minibus returned with our local guide Cecilia to take us to Los Glaciares National Park's massive treasure — the Perito Moreno Glacier. About 50 miles from Calafate, Perito Moreno is the most popular glacier in Patagonia, mainly because it is so accessible. 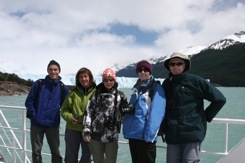 Along the way, Cecelia gave us a wealth of information about the the park, the glacier, and the local flora and fauna. We even pulled over at one point to observe condors fighting over some road kill. In the sky they are enormous and graceful birds, but up close they are incredibly ugly. Apparently, their bald head has evolved that way for easy maneuvering in and out of carcasses; yuck. Once within the park, and moments before our first glimpse of the glacier, our driver put on Also Sprach Zarathustra and timed the climax perfectly just as we reached the vista point. Hurrah! The Cauquenes de Nimez is the full width of about 25 shoulders. It really is enormous. At 97 square miles, its area is the same as that of Buenos Aires, and from this view we were only seeing but a fraction of it. 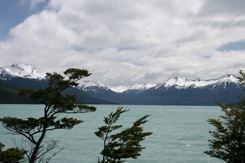 The winds were too strong to stay here long (the view point had a 20 ft long glass pane for protection! ), so we continued on towards the visitor center while Cecelia gave us more background. The word perito in Spanish means expert and is an honorific title of sorts, and Moreno refers to Francisco Moreno, an Argentine explorer and academic who was sent by the Argentinian government in the mid 1880s on a surveying mission along the Andes and down into Patagonia. 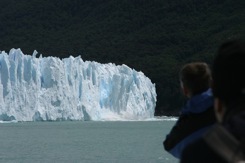 Ironically, he made it within miles of the glacier but never actually saw it. Despite this gross omission on his part, the government still named the glacier after him. 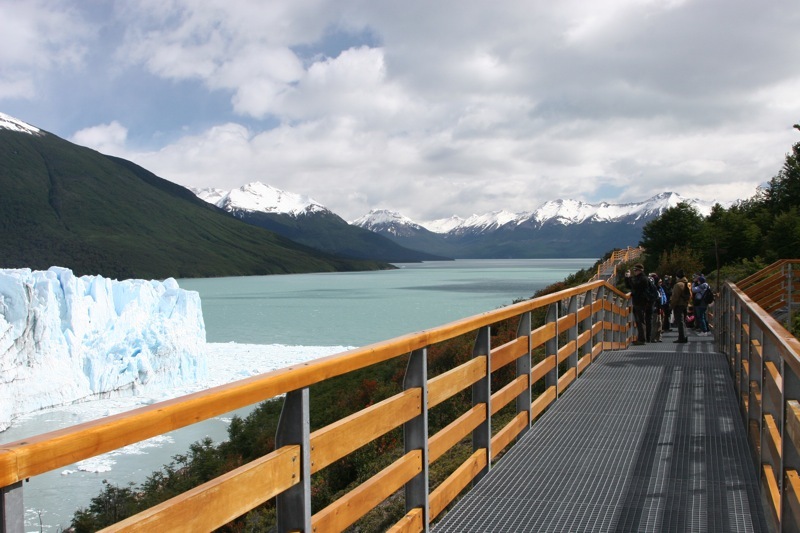 When we reached the visitor center, Cecelia led us down an elevated walkway fitted with high-quality wooden rails down to the southern side of the glacier for a closer look. She said the walkway was a new addition to the park and although she didn't know how much it had cost, the cost must have been considerable. 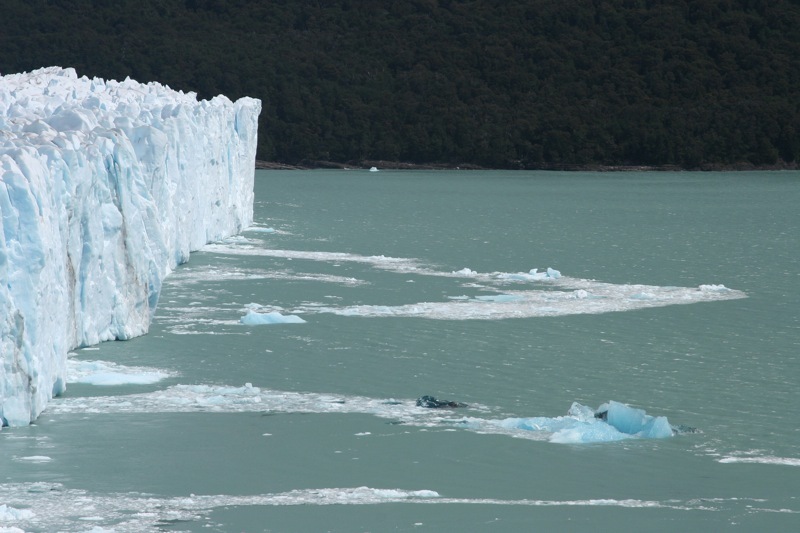 From up close, one could see where the ice reaches land and begins to twist and warp before breaking off piece by piece into the lake. At the point where the lake touches the lake shore, it acts as a natural dam, dividing the Lago Argentino in two. 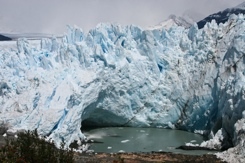 And because the southern part of the lake is at a higher elevation, each spring the water gradually forms an arch in the ice, which gradually erodes away until it is weakened to the point of collapse and falls into the lake. The last time that rupture occurred was in 2008 and before that 2006 and 2004. And before that, you'd think it was 2002, but in fact, it was 1988. There is no real pattern to it going back all the way to 1917. 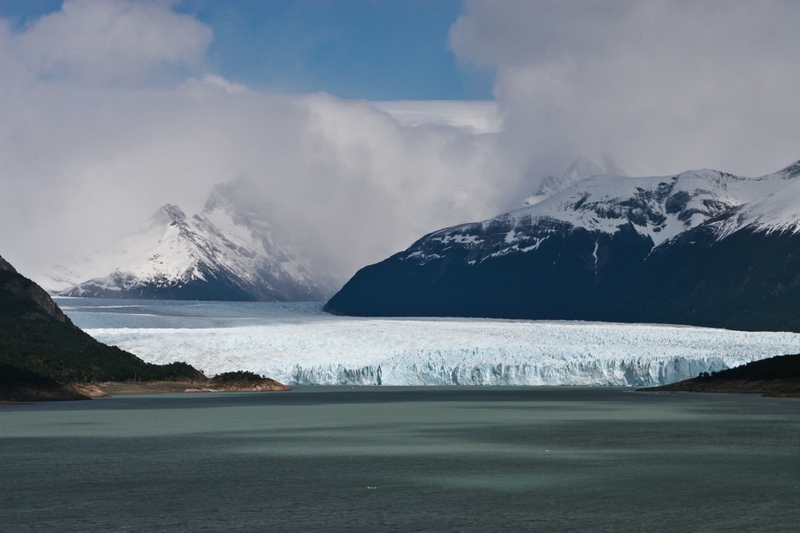 Perito Moreno is one of the few glaciers in Argentina, and indeed the world that is actually growing in size, the reason for which is debated by scientists. Evidently, the effects of global warming have yet to make an impression here. At the edge of the lake, the ice is on average over 60 meters above the surface of the lake and extends another 100 or more below the lake. A few of us wanted to get an even closer look and boarded a boat that gives tourists a view from otherwise impossible angles and gets as close as 300m from the ice. Any closer than that would be extremely dangerous as the captain may not have enough time to react to ice blocks breaking off and turning into icebergs, an event that occurs every 15 minutes or so. 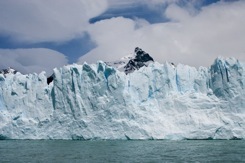 The strong winds can then carry the icebergs at great speed in unpredictable directions. 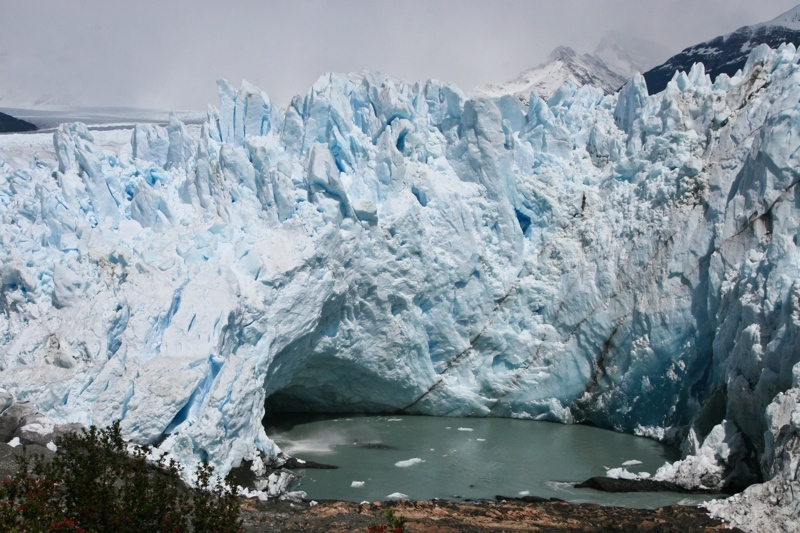 The glacier draws so many visitors that the Park has invested what must be a fortune to erect miles of elevated walkway. 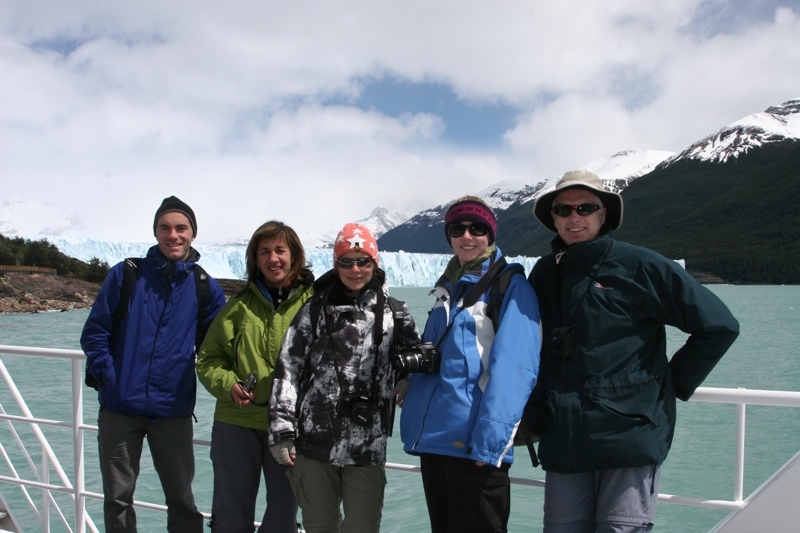 Having fully explored Perito Moreno to our satisfaction, short of ice trekking on top of it, we headed back to Calafate and arrived mid-afternoon, in time for a late lunch and some souvenir shopping before dinner. Nicole and I tried a terrific restaurant called the Cambalache based on the recommendation of a shop owner. Having skipped lunch at the glacier, I was famished and ordered the hearty lamb stew, which was delicious. While we were waiting for our food, the waitress left to take her daughter someplace, which left the restaurant unattended save for the chef in the kitchen. She probably didn't think it was a big deal since this was siesta after all, but a few locals came in for a drink and not seeing anyone in charge simply grabbed a couple of large beers from the fridge, dropped some cash at the register and sat down at a table outside. I was impressed; they had a problem and found a solution. We had dinner not far from the Cambalache but at a very average restaurant in comparison. Still feeling heavy after the stew, I got by with a simple soup and a few of us left dinner early to had back to the hotel before dark. Remember, the Cauquenes is located in the boondocks reachable only over dirt roads. The lobby of the hotel was unattended, and making like the two men at the Cambalache, Helena went behind the counter, grabbed her key off the wall and turned to the rest of us: "which key would you like?" 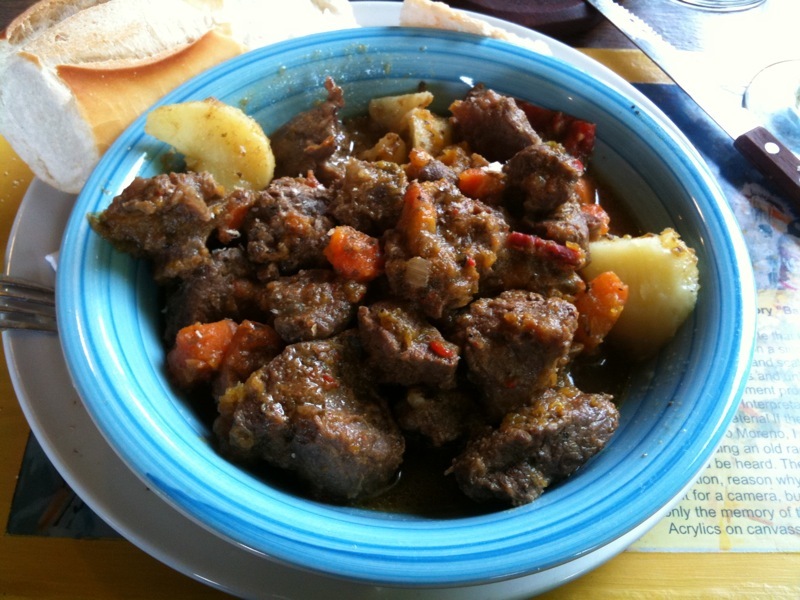 The lamb stew at the Cambalache was just what I needed to fend off the cold I had caught.